Ernő Tóth was born in 25. December 1949 in Sajóecseg, Hungary. Schools: 1964-68, Secondary School of Fine Arts; 1974-79 Academy of Fine Arts. His masters: Szilárd Iván, Jenő Barcsay and László Patay. Membership: National Association of Hungarian Artists, Hungarian Artist’s Association, Hungarian Painters’ Society, DunapART Art Society, Inner City Artists’ Society, Hungarian Art Workshop Society. Also Ernő Tóth is no longer what he used to be. Were I talking about an aging football player, it would be not very flattering to say this. But if you think about it, whatever is not what it used to be has something new to it. It is this newness, this Ernő Tóthian novelty, that I would like to attract your attention to. It seems as if his well known cheerful, sarcastic, grotesque world of strident colours has been affected by the somewhat uneasy, depressing atmosphere prevailing today. As if his optimistic, triumphant philosophy, his confidence that everything is possible, has been shaken. His works so far have been characterized by intense boundlessness; nothing but the frame (definitely not the limitations of imagination!) fixed the limits of his lush gardens, set tables, stages or circus rings. Some of his new works however have something of a sad, insecure air about them. I would not say it has anything to do directly with the general economic, moral, and value crisis weighing on us all, although I would not deny it either. At a recent group exhibition of the Hungarian Art Workshop in the Renée Erdős House a group of statues caught my attention. It apparently looked like most of Ernő Tóth’s sculptures - skeletal bodies in grotesque poses, with gnarls on the surface that might be muscles, but might also be called an encounter of the sculptor’s hand and the will of the cast on the dissecting table (to use a classic mixed metaphor). Looking at the group named The Party is Over one sees three gaunt Gypsy musicians gloomily carrying their instruments, every gesture suggesting that nothing is what it seems; the violin and the viola are both silent, the members of the band, specialists of merrymaking, are wearily plodding along in a vacuous manner. What the group shows here is not something, but the aftermath of something. 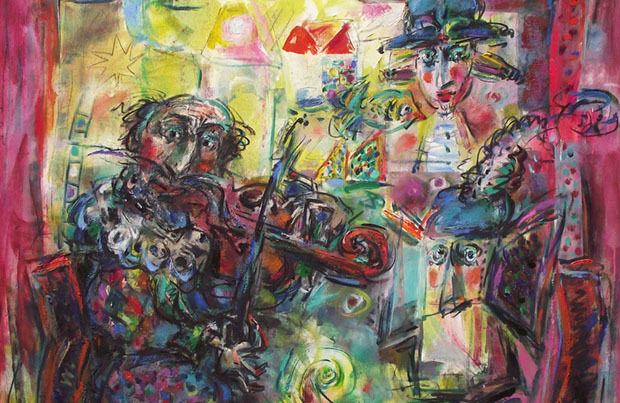 And the impression is as though it were not only the end of a party (like in Petőfi’s poem, “putting an end to the music, the lads go home”) but the end of Gypsy music as a whole. This melancholy musicians are going home for good for, in the words of a well-known sentimental song, “no one wants their music any more”. The reason why I dwell on this little statue which is not even included in the catalogue, is because it seems to be pointing towards a new, more contemplative attitude on the part of the artist. There is a similar picture in the book, entitled Looking For the Way To Go. The figures marching in it seem to be lost, all wearing masks, one of the pushing a donkey ridden by a messenger (or the Trickster King himself) - all this in mysterious moonlight, under the yellow disk of the moon. The title could be A Midsummer Night’s Dream as well, but that title is reserved. Yet the mood is that of a Midsummer Night’s, and like in the comedy, anything may happen. We cannot tell who are hiding behind the masks. Fairy kings, elves, goblins, craftsmen transformed? That donkey could be Bottom - let him play the lion too. Nor do we know where they are going. Maybe they don’t know either - that’s why they are looking for the way to go. And, apparently, they are being late. Wanderers normally repose for the night; but here, in the picture, they are still on the road although the moon has come out. Shell we ask the painter who these figures are and where they are going? Are they going to give a performance? Or are they leaving the stage like the Gypsy musicians? There is no point in asking - the painter does not know himself, otherwise he would not bother with paint. At any rate, it’s not the story that counts. What counts is the impression we get. The impression that something is wrong. Broken. The world has gone astray, and we are at a loss too. It is possible that we are riding the donkey and we are going to act in the circus. And where’s the circus? Is it what surrounds us? Or, to paraphrase the bard of Avon yet again, is all the world a circus ring, and all the men and women merely clowns? 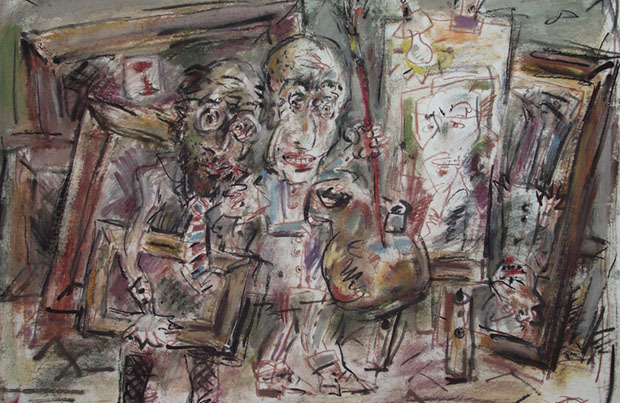 Of course, Ernő Tóth has not become gloomy, nor has he lost his old sense of humor, his grotesque way of looking at things, or his parodic tendency to caricature. He still possesses it, and it is good that he does, for there are so few painters who brighten our mood with their colours and their way of rendering their figures, that we’d better appreciate them. I really don’t know what to keep my fingers crossed for. This new and yet old Ernő Tóth (old, too, for he’s already had a period like this), or the distinctive, colourful, whirling, familiar and beloved imagery that really made his name known? I am afraid I am going to commit the sin of compromise. I am pleased by Ernő Tóth’s new tone because it means progress rather than return; with the addition of a new, deeper dimension, it preserves the artist’s previous achievements and his highly individualistic style. In the world of Ernő Tóth, dream and fantasy never become separated from reality, the possible from the impossible, the good from the bad, the tragic from the funny, the face from the mask, or the beautiful from the ugly. 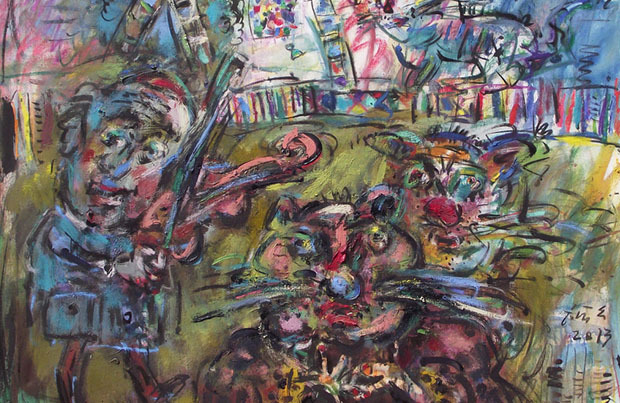 In his pictures many figures swarm in colourful crowds, usually in a cheerfully optimistic mood, but he always depicts the reverse as well as the fair side of things. In one of his pictures he evokes the world of the 1950s, which cannot be more than a childhood memory, with the typical rock ‘n’ roll guitarist, a long- tailed car, the then fashionable hula hoops, and a hot girl resembling Marilyn Monroe. By the way, childhood. I once called Ernő Tóth a “scribbling artist”, which might not sound like too much of a praise at first, but I did explain what I meant by this. What I meant was the interplay between deliberateness and spontaneity, preserving - even in a hastily scribbled line - something of the child forever present in a good artist, alongside the learned and practised skills of the art. What is a hastily scribbled line but yet another chance given to chance, spontaneity, naturalness? There is always more to art than just consciousness-driven action. Perhaps there is no conscious artist at all. Those who are called that are usually the ones who can interpret their work in a cultured manner - with the benefit of hindsight. But when they work they do not rationalize - they just paint. That is why we speak of inspiration, that mysterious generic term that no one knows for sure what it is. Maybe it is just a lucky state of the artist’s personality, a state that helps create good, true, and honest work. I guess inspiration cannot be willed, because it’s something much richer and more complex than mere will. The presence or absence of inspiration can mostly be inferred from the result in retrospect. Look at the work and find out if the artist had inspiration. Back in the era of isms at the beginning of the past century, there were already many who believed that serendipitous discoveries could be more fruitful than whatever was deliberately sought after. Picasso claimed he never knew exactly what the picture he was working on would turn out to be in the end. Paintings, he said, created themselves; his hand went where the brush was leading, and if the blue paint was not at hand, he used red. You’d better take his words with a pinch of salt. Trust Marcel Duchamp instead who once said his chance was not everybody’s chance (something that dilettante painters of abstract art tend to forget). Like inspiration, chance favours only the prepared mind. The world of Ernő Tóth is, of course, a very consciously structured world with laws rather unlike those that govern reality. His world was not created in six days, and it has not three but a multitude of dimensions - the three dimensions of space are as tight as a mousehole compared to the dimensions of feeling, thinking, jokes, dreams, and imagination in the artist’s world. 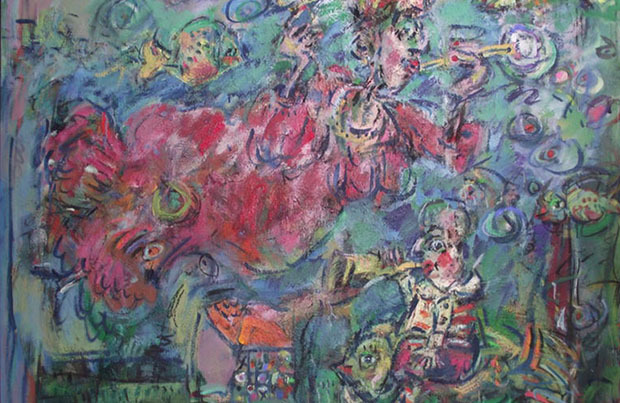 Ever since the time of Surrealism, operating with metaphors and dreamlike visions, there has been no need to pictorially or physically justify how Chagall’s couple could be floating through the air. Easy. What makes them float up there? Happiness. Similarly, in Ernő Tóth’s pictures, fish are not banished to the water, birds to the sky, four-legged animals and humans to the surface of the earth. Here, swimming birds are just as acceptable as flying fish, and the dressed up lady eels just as great in an aquarium as in a garden or on a richly laden table top. Here, there is no hierarchic separation between plants and animals and humans; indeed, even imaginary creatures - goblins, goat kings, centaurs, fish birds, coquettish frogs with large breasts - are on a par with them. In the pictures of Ernő Tóth a democracy of creatures prevails. And a freedom of lines, too. In his world, parallel straight lines do not meet at infinity; in fact, they are not entirely parallel, nor, let’s admit, really straight. Here, straight line in the real world either - it is merely a fiction of Euclidean geometry. The space of the universe is curved; indeed, it is round, according to the latest research. It closes in on itself both inside and outside. I do not intend to elaborate on this now; I only mention it because even reality is different from what it looks like. The apparent absurdities in Ernő Tóth’s pictures seem - or have seemed until now - inconceivable. 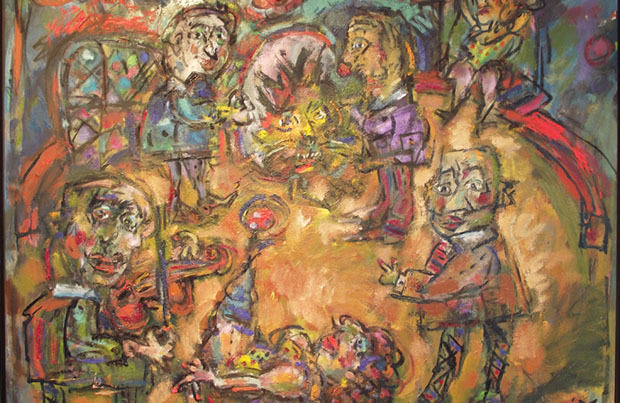 In Ernő Tóth’s pictures everything is painted imaginable. Well, why do light bulbs emit black rays? Black light? Isn’t that quintessentially absurd? But what if burnt out light bulbs just emit black light? It is an old discovery in children’s scribbles where the sun in pencil radiates black rays in every direction. We know that children scribble what they cannot put into words. And we know that poetry was invented by someone unable to keep emotions within the boundaries of prose. Goethe was right: Art is the mediator of the ineffable. According to Ortega, metaphors in art were originally code names used to avoid mentioning taboo subjects; they were used for things, like evil spirits, that people were forbidden to name. Today, they are used for things that people are unable to name. Take a look at the vibrant colourful, flickering pictures from a short distance, then step back and squint your eyes to discover really strange things. From a short distance, everything and everybody seems mocking, a little crazy, funny and unique, while places and situations seem absurd; at first sight we really can’t make heads or tails of it all. What meets the eye close at hand is a world that is plain ridiculed, and frail, utterly lacking in respect, grandness, seriousness or harmony. Stepping back however we can see beautiful, lively colours, bouncing lines, and fluttering planes in total harmony; greens and pinks and purples in bright, airy structures in bashful symmetry or natural asymmetry. Well, isn’t the world really like that - looking different in close-up than from a distance? Just think of politics: how grand, how respectable do politicians seem from a distance, and how petty and ridiculous they often are on closer inspection. 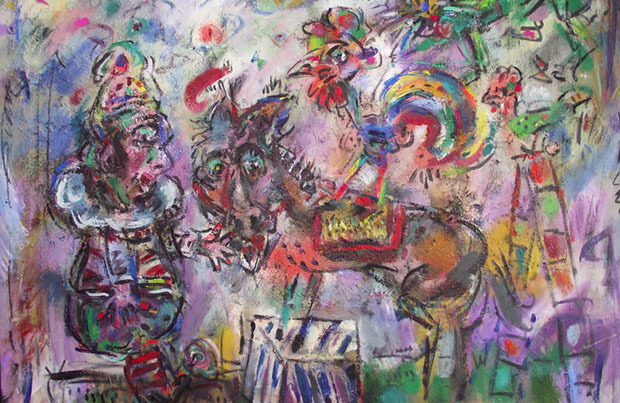 Ernő Tóth does not seem to respect God or man, yet he deeply respects those looked upon as fools by others: the Don Quixotes, clowns, superannuated women of pleasure, fat acrobats, fallible yet jolly buffoons. Are his pictures beautiful? One might say that grotesque or ugly feet, noses, gnarled buttocks, crumpled light bulbs, vague spots are pulled together to create something unsettlingly or irresistibly beautiful. One might say also that beauty is not actually an aesthetic category. In fact, it does not even exist per se. What the term expresses is merely our relation to objects, landscapes, pictures, women, or flowers. A good picture is true, not beautiful. What makes it beautiful is that we love it.